The Maharajah of Mysore was the first indian invited to use the Club in 1914. 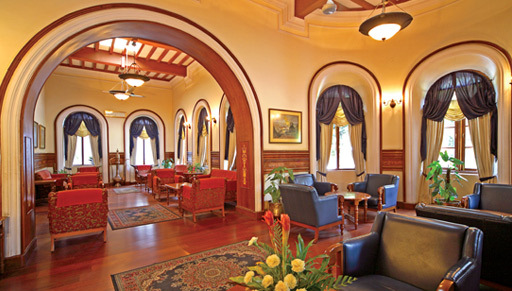 As a tribute to the long association of the Wodeyars of Mysore, the Club refurbished the dress lounge and turned it into a formal lounge called the Mysore Room, in the summer of 1990. The entrance to the Mysore Room bears the 'Ganda Berunda' or double headed eagle, the royal insignia of the court of Mysore. The inlay work, wood panels, cladding on the walls and engraving on the furniture are typical of Mysore’s traditional craft, concepts borrowed from the Mysore Palace. The walls are decorated with vignettes of the famous Dassara procession as well as portraits of the Royal family that gives one a glimpse of the golden era of the Mysore royalty. The Mysore Room provides a calm sanctuary and a cozy atmosphere, away from the bustle of the Main Lounge.